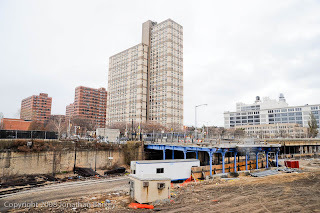 So, the first alarming thing about Forest City Ratner's contract with the city Department of Transportation (DOT) to rebuild the Carlton Avenue Bridge was the revelation, as I reported in January, that the developer had three years to complete the job without penalty, even though the Final Environmental Impact Statement (FEIS) produced by the Empire State Development Corporation (ESDC) disclosed the work would take two years. 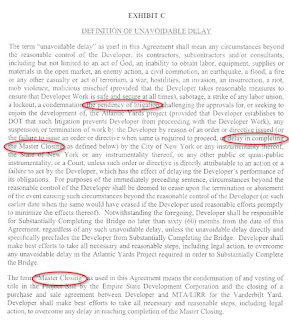 Among the definitions of Unavoidable Delay is a delay in "completing the Master Closing," which is defined as including the ESDC's exercise of eminent domain and the closing of a purchase and sale agreement with the MTA/LIRR for the Vanderbilt Yard. Neither have been accomplished. And if an arena would not open until 2012, in the best-case scenario, that means Forest City Ratner might want to have four--nearly five--years to complete work on the bridge. "They have reached out to us," David Woloch, the DOT's Deputy Commissioner of External Affairs, said at a meeting last night of the Council of Brooklyn Neighborhoods (CBN). "The essence of what's been suggested is that... if there's a delay in completing the Master Closing by the ESDC, that's an Unavoidable Delay." I heard one "yes" from Woloch's group of four DOT officials, but Chris Hrones, Downtown Brooklyn Transportation Coordinator, said, "We're still working on that." The state eminent domain case dismissed last week, Hrones said, was cited by FCR as "something that prevented them moving forward in their estimation, because it really put the project in doubt." "Since that court case has been resolved, at least by the Appellate Division, I think we feel like, we'd like to get an explanation why they aren't proceeding," Hrones said, adding that DOT is seeking a meeting with the developer. "We definitely want some answers from them. "If that's preventing them now," she said, "it should've been preventing them from taking it down in the first place" and inconveniencing people with a half-demolished bridge. FCRC’s construction schedule has been carefully drawn to allow the arena to be ready... by commencing work now on vacant properties that are owned by FCRC, the MTA and the City, with work on properties that are owned or occupied by other parties deferred until the pending judicial challenges to the Project have proceeded to a point where ESDC is in a position to actually use its powers of eminent domain to acquire title to and possession of those properties. Still, the DOT may have only partial leverage. 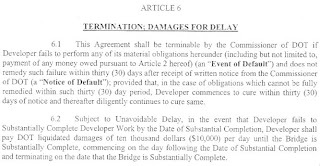 The contract's definition of Unavoidable Delay, noted above, provides "that Developer establishes to DOT that such litigation prevents Developer from proceeding with the Developer Work." But there doesn't appear to be such slack in the definition of Master Closing. "We're going to try, on behalf of the city and on behalf of the taxpayers of the city, to make sure that, given this contract, we get the best deal out of it," Woloch said. "If they come to us and want X months to count as an Unavoidable Delay, and we don't think that's fair, then, we'll push back. We want to get the bridge open as quickly as possible." Beyond that, unmentioned at the meeting, there's additional contract language that allows reconstruction of the bridge to take more than five years if the "unavoidable delay directly and specifically precludes the Developer from Substantially Completing the Bridge." In other words, there seem to be two levels of Unavoidable Delay--one a rather malleable term and one that means what it says. Was the ESDC informed, when the FEIS was produced, about the potential for a 36-month closure? DOT staffers responded that 36 months was supposed to be an outside bound, since the bridge could be reconstructed within two years. I followed up: But was the ESDC informed, so it could be disclosed in the FEIS? "As far as I know, not by DOT," Woloch said. "The negotiation was in the contract with Forest City.... They wanted a cushion." While that's understandable, and probably not unusual in contract negotiations, the contract came after the FEIS was finished, and ESDC had no oversight role. If a post-FEIS contract can trump the information disclosed in the environmental review, what's the point of the ESDC review? Woloch said there's no current schedule for completion of the bridge, but "we have reached out recently" to try to find out. "As much as some of us don't like this project, we also don't want it to happen badly," Carponter said. "Now, we've got a project we hate that's happening badly." DOT officials were asked whether the Fire Department had cleared the closing of the bridge, given that a fire station is nearby on Dean Street. Joe Noto, executive director of the Office of Construction Mitigation and Coordination, said yes, and that Fire Department brass felt confident that response would not be hampered. "Since the bridge closed, we haven't reached out for updates," he said, "but they haven't come to us" with complaints. Some community members, however, have said individual firefighters have indicated dismay at the closing. Also, Hrones said that DOT would require five weeks notice before any major street, such as Fifth Avenue north of Flatbush Avenue, would be closed. Could a temporary replacement for the Carlton Avenue Bridge be built, serving pedestrians and bicyclists? No, the group was told; it would cost $5 million and take two years to construct. Is the DOT involved in plans to amend the ESDC's Modified General Project Plan, which may be coming in the next month or two? Not yet, the group was told. and, have costs tripled in the last 5 years?